Republican gubernatorial candidate Secretary of State Kris Kobach has claimed direct primary care would significantly reduce state spending on Medicaid. But experts say without a pilot program, no one knows whether that's true. 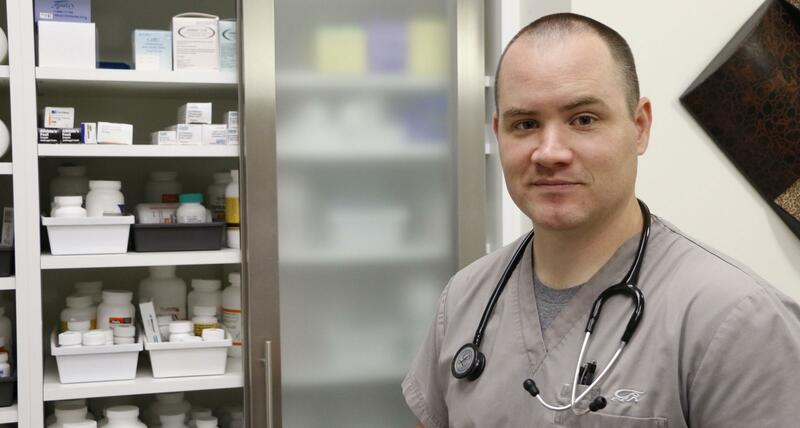 Wichita direct primary care doctor Josh Umbehr. Now, Umbehr is advising the Kobach campaign on the issue. He also practices medicine in the Hartman Oil Building — the same place where Wink Hartman, Kobach’s running mate, headquarters his oil company. The Kansas Department of Health and Environment, which manages Medicaid, told the Kansas News Service it hasn't yet done a cost analysis of using direct primary care for Medicaid. But it’s open to a pilot program if it’s supported by a future governor and legislature. “Direct Primary Care would result in significant savings. We will be looking at all kinds of measures to increase the efficiency of our Medicaid delivery and to improve the satisfaction of Medicaid patients. Direct Primary Care accomplishes both. The patients love it, and the doctors love it, too." Few issues split Kansas politics like the Obama-era expansion of Medicaid. Unlike 33 other states, Kansas still hasn't expanded its Medicaid program under the Affordable Care Act. The decision would pay for the health care of thousands of people who don’t currently meet the program’s stringent eligibility requirements.